Studios have long been a tradition in the world of comics, from the early sweatshops to more recent space-sharing from mainstream artists. Only in the last decade or so have alt-cartoonists decided to rent work space together as a way of becoming more productive, of getting out of the house and of being with like-minded individuals. Brooklyn's Hang Dai Studios consists of alt-comics veterans like Dean Haspiel and Josh Neufeld as well as a host of newcomers. 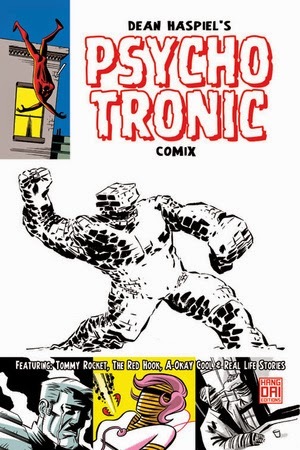 Dean Haspiel's Psychotronic Comix. This is a great sampler of Haspiel's work. He's always been a comics "tweener" in that he's had one foot in the mainstream comics world and one foot firmly in the alt-comics world. That was the case even when mainstream comics wasn't all that interested in his work; he just has a sensibility that's greatly influenced by Jack Kirby as well his mentors, Walt Simonson and Howard Chaykin. The comic starts off with a tribute to his collaborator Harvey Pekar, who illustrated one of Pekar's few long-form works in The Quitter. 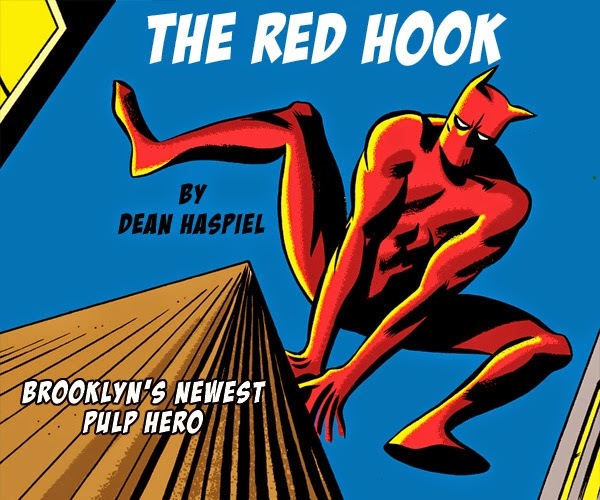 Then there's a Gene Colan-style street level superhero comic featuring an origin story for The Red Hook (which is also a section of Brooklyn). It's stylish and features great character designs. Then we get an emo-superhero tale in "Tommy Rocket", followed by some superhero silliness with his team A-OK Cool struggling with breakfast as well as fighting on other worlds. This sort of loosely-assembled and plotted work is Haspiel at his best, especially when he introduces color into the equation. It's not unlike the sort of thing that Jim Rugg likes to do, only Rugg is more of a style chameleon than Haspiel, whose trademark exaggerated facial expressions and thickly inked lines always put a stamp on his work. Haspiel then shifts to autobio, with a strip about an old bar that would come to mean a lot to him, and eventually it was too much for him. Haspiel has a talent for spinning yarns about places that has great significance to him, and this story is told with great economy. There are funny stories about his misadventures with marijuana, a hellish experience with a neighbor who may have been a robot (shot straight from his pencils, giving it a nice sketchy effect) and a story about founding Hang Dai. The quick-hitters work best for Haspiel, especially given his tendency for noirish narrative captions and stylized dialogue. Giving the reader just a hint of where his mind is wandering and then moving on to something else made this a rich reading experience. The Giant Effect, by C.Cassano. This little fable about a cruel sheep-devouring giant and his eventual downfall is viscerally told, with the giant-flesh-hungry expressions on the sheep being especially effective. The sepia wash and Cassano's thin line add to that mythological feel of the story, while the lettering varies according to the story's needs. This is a clever and effective comic. 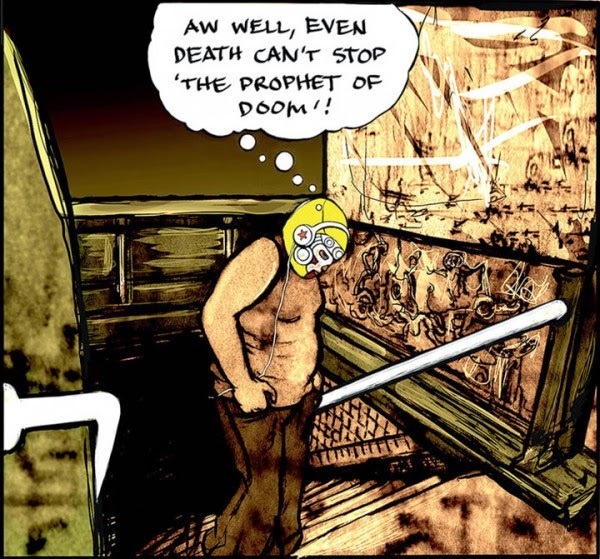 The Vagabonds #3, by Josh Neufeld. It's an interesting transition of sorts for Neufeld, who started his career writing stories about his travels around the world and his observations. He's still travelling and observing, but he's doing so in the context of being a comics journalist now. His specialty is on-site interviews that obtain personal experiences from major events. For example, "Superstorm Stories: A Red Hook Family" is all about one family's experience in cleaning up from the storm, focusing on the loss of a lifetime's worth of reading materials. Neufeld uses single-tones for his panels and switches them up as a means of identify time in a story with a hopeful ending. 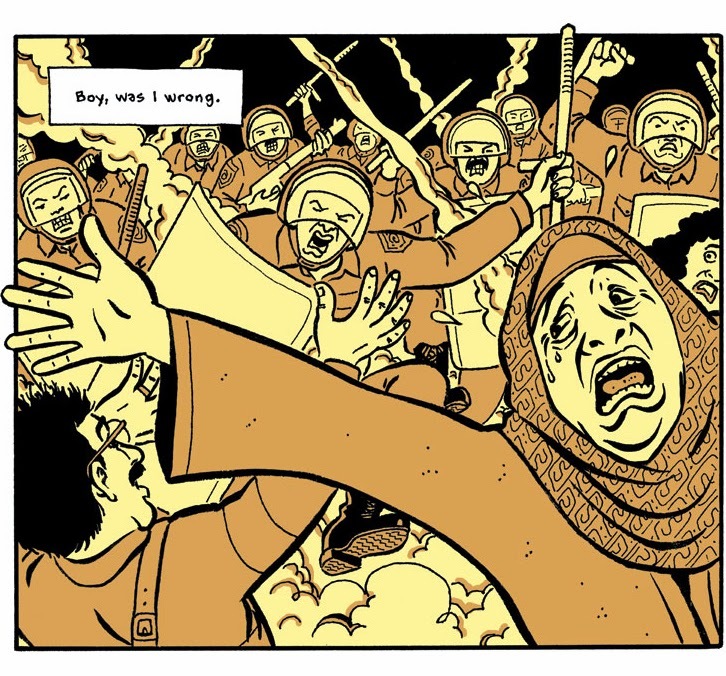 Neufeld isn't afraid of more nuanced and complicated stories, as "Bahrain: Lines In Ink, Lines In The Sand" indicates. This is one of his best-ever stories, as it details the stories of two friends he made while spending time in the Middle East country as a representative of the U.S. state department. Through their stories, Neufeld details an uprising in that country and how widely opinions varied on who was a terrorist, who was a traitor and who was an activist. There were no easy answers to be had and Neufeld doesn't pretend to have any, preferring to allow each story to make its own case. There are more lighthearted pieces as well, like a page about Turkish tea, another couple of pages detailing his involvement as a Knight-Wallace Fellow at the University of Michigan (this had his most lively, colorful cartooning in the book), and reimagining public education. Neufeld's cartooning has always been more functional than exciting, which befits his tendency to view stories as problems to be solved in order to get across a particular experience. He doesn't have the chops of some other comics journalists, but he gets around that by using a number of different approaches. He might use color in a non-intuitive fashion, might use a minimalist line, might invoke parody or satire in his character designs or might play it totally straight and do naturalistic art and colors. 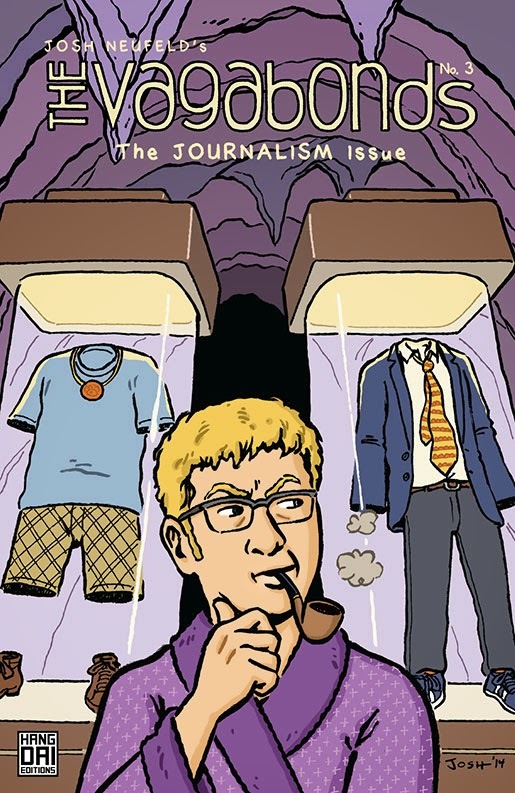 Especially with regard to his journalistic comics, clarity is more important than any other quality, but Neufeld's instincts are always to push the reader just a little bit so as to get across information in a way that will make them remember it. It's good to see him back in comic book form once again, both as a home for a number of comics that originally appeared on the web as well as having an opportunity to do other kinds of short-form experiments. 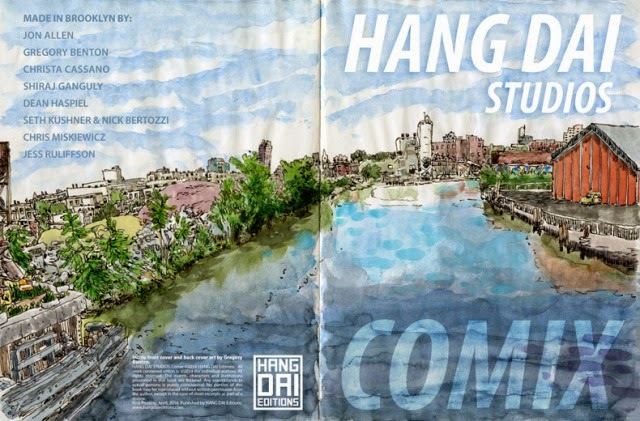 Hang Dai Studios Comix. This is an anthology from some of the artists who share space in Hang Dai. As such, it's not especially cohesive, given the wide disparity of styles. It's more instructive to read it as a sampler rather than a cohesive statement or expression of an editor's vision, a sampler that reflects a certain point in time for these artists. Christa Cassano's smudgy line and sepia tones really seem to be her trademark at this point, and she's as at ease doing a story about an outcast in the city as she was in drawing a giant being devoured by sheep in her mini. Seth Kushner & Nick Bertozzi's "Schmuck: Raising The Bar" is one of Kushner's semi-autobio comics about meeting up with a past fantasy girl in a bar and the rather ridiculous circumstances that result. Bertozzi's figurework elevates the material, which was appropriately amusing but didn't quite go far enough in either the direction of raunch or laughs. 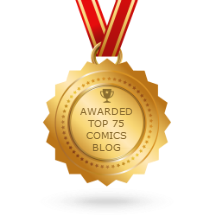 Shiraj Ganguly's "Savior" is a nicely-drawn, silent story about the downside of being a super-champion. The two real highlights of the comic were quite different. Jess Ruliffson's "Haditha/Katrina" is another one of her interview comics with veterans of recent conflicts. She has a tremendous knack at breathing life into transcripts by way of her sketchy and expressive line and a sense of how to visualize both big and small moments. Gregory Benton's "Teratoma" is a bizarre and colorful story about a creature willing itself into life and encountering a woman who turns its existence around. Kushner, best known as a talented photographer, then provides an account of the studio's evolution and the various artists who ply their trade there. It's a great snapshot of this current studio-related movement in indy comics.